Welcome to Little Flower Catholic Church! We are a community striving to grow in our relationship with Jesus and to share His love and mission with all those in need. 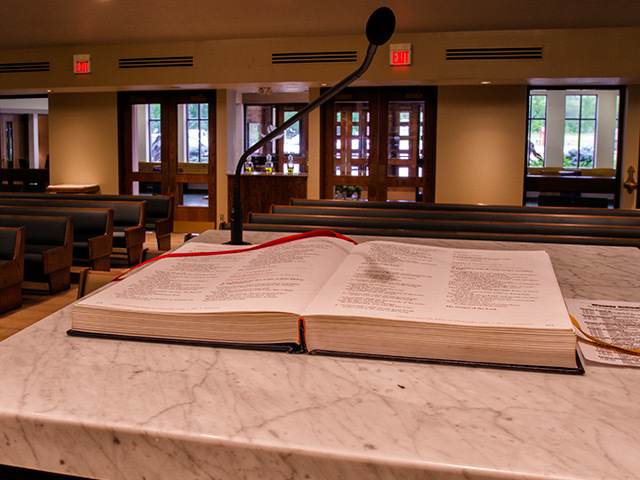 While our parish community is made up of individuals seeking to find God in every aspect of our lives, the heart of who we are takes place here in our Church as we celebrate in Word and Sacrament. It is the sacramental life of our Church that marks us as Catholic Christians and strengthens us to go forth in Jesus’ name. Our Catholic faith is rich in rituals and symbols, all of which draw us into the mystery of God’s saving mercy and love. The sacred space of our Church sets the stage for a profound encounter with Jesus and with one another. 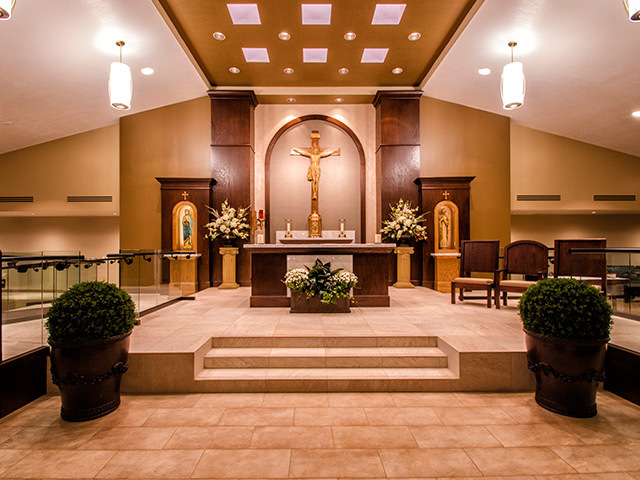 Each aspect of our space is designed to strengthen that encounter and remind us of who we are as beloved children of God and disciples of Jesus Christ. Little Flower Church stands as an impressive and significant witness of Catholic presence to all who pass by. Ours is a diverse community in which we welcome people of all ethnic, economic and social backgrounds. Together we strive to embrace our call to be intentional disciples of Jesus Christ, growing in our relationship to Him and making His presence visible in our world. 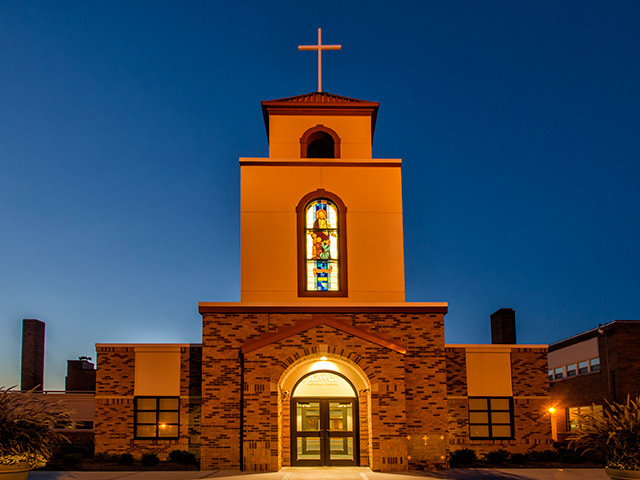 At Little Flower Catholic Parish, we are privileged to share our entryway with St. Benedict Catholic School. This partnership allows us to promote and support an integral faith and intellectual formation. Supported by Little Flower Parish and Our Lady of Lourdes Parish, St. Benedict Catholic School forms students who will transform society through faith and compassion. We recognize that each person’s journey of faith is unique and that it is often an experience of truth, beauty or goodness that draws one closer to God. 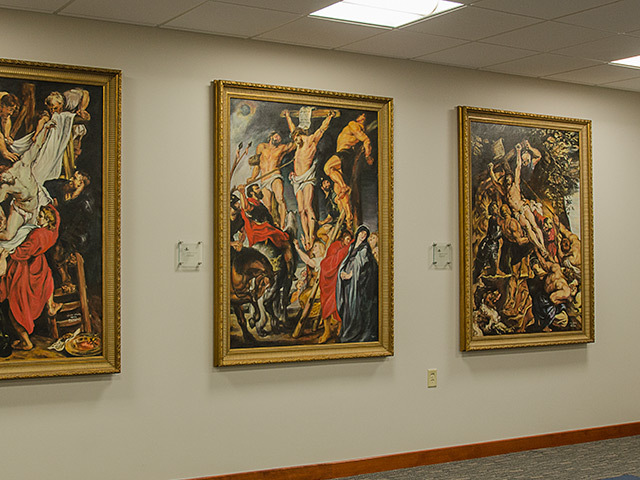 In our St. Benedict Gallery, we feature artwork that lifts our minds and hearts to God. Upon entering the Church, we pause at the baptismal font, a reminder of our entry into the family of God. The Easter Candle stands to call us to commit our lives anew to Jesus, the Light of the World. The waters of the font recall our dying and rising to new life in the Spirit. In Baptism, we are washed clean of the stain of original sin and invited to share in the very life of God. 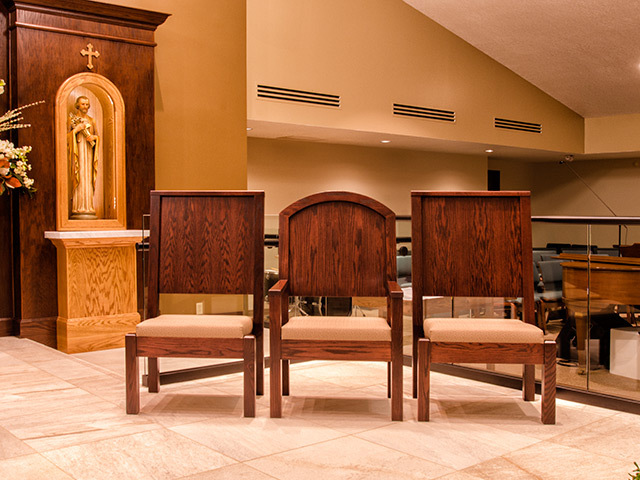 The stunning and simple re-design was inspired by and modeled after the Archbishop of Krakow’s Chapel in Poland – the sacred space where Karol Wojtyla was ordained a priest in 1946 and where he later prayed as the Archbishop until he was elected Pope and took the name John Paul II. 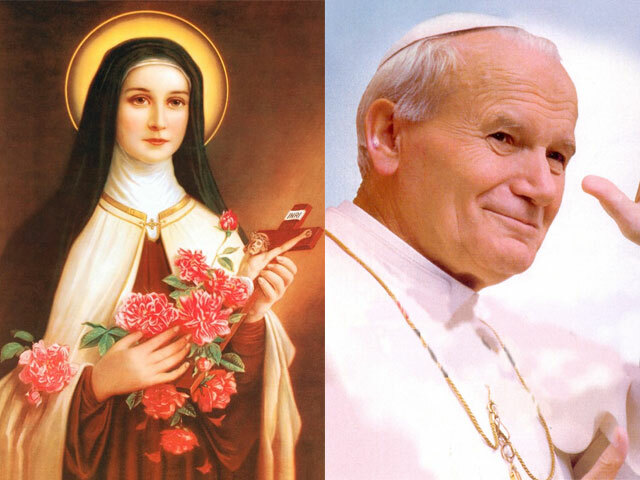 Having been inspired and strengthened by a devotion to Saint Thérèse, the Little Flower of Jesus, Pope John Paul II named her a Doctor of the Church in 1997. The highlight of the Church proper is the sanctuary in the front of the Church. Our attention is focused here for this is where the celebration of Eucharist takes place, and Eucharist is the source and summit of our lives. In the left portion of the sanctuary stands the ambo (pulpit) from which the Word of God is proclaimed. Each Liturgy of the Eucharist (Mass) begins with the Liturgy of the Word wherein we hear the Great Story of Love as found in the Scriptures. 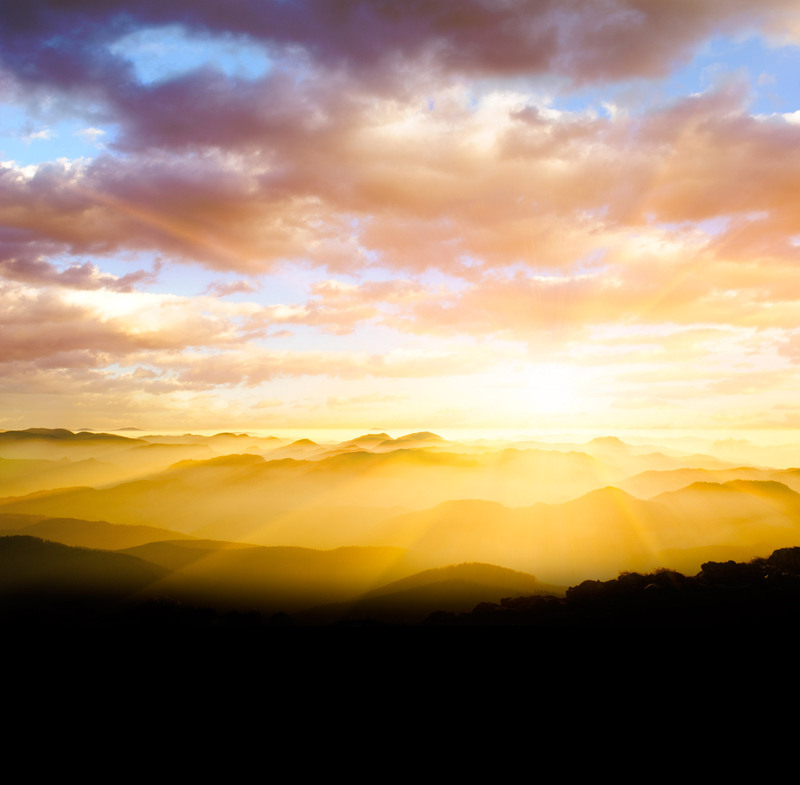 Old and New Testament readings recall for us the story of creation, redemption and salvation and call us to conversion of life and conformity to the Word of God. Directly behind the altar in the center of the sanctuary are the tabernacle and crucifix. 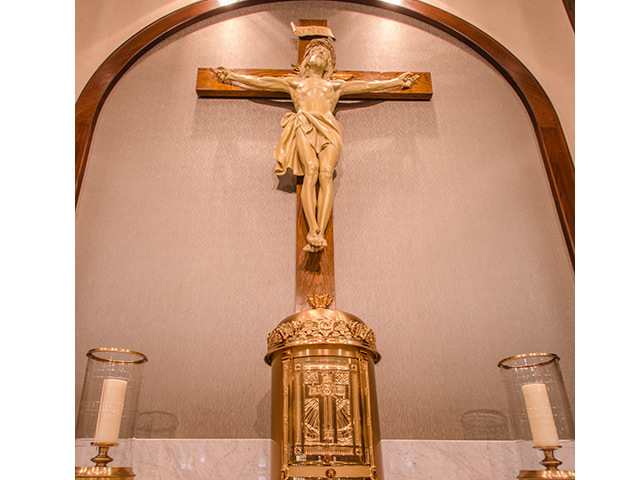 The crucifix is a constant reminder to us of the love and mercy of our God made visible in the sacrifice of Jesus’ life for us. It is this sacrifice that is made present and renewed at each celebration of the Mass. At each Mass, we are fed and nourished with the Body and Blood of Jesus Christ. 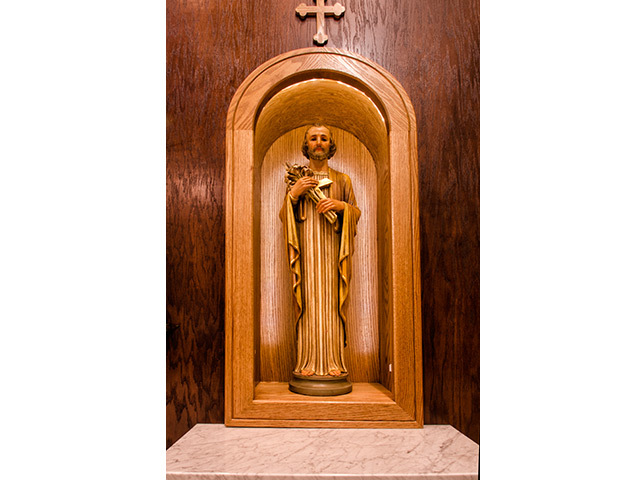 Once the Mass has ended, any remaining hosts are placed in the tabernacle. 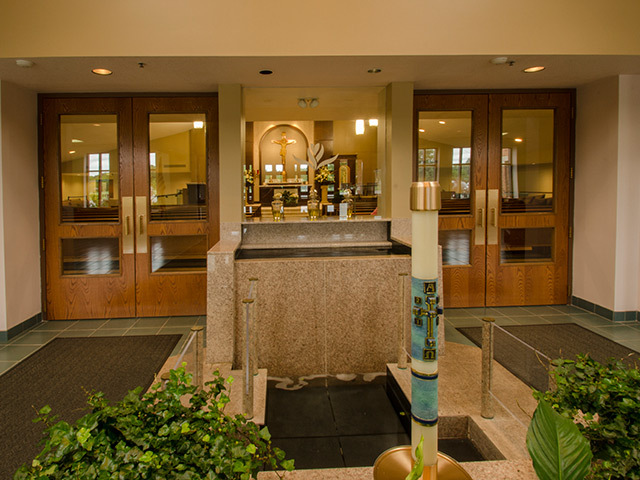 The Eucharist is preserved here to provide Communion for the sick who are unable to join the community for Mass. Preservation of the Eucharist in the tabernacle also allows the faithful to spend time in adoration and devotion to the Blessed Sacrament. 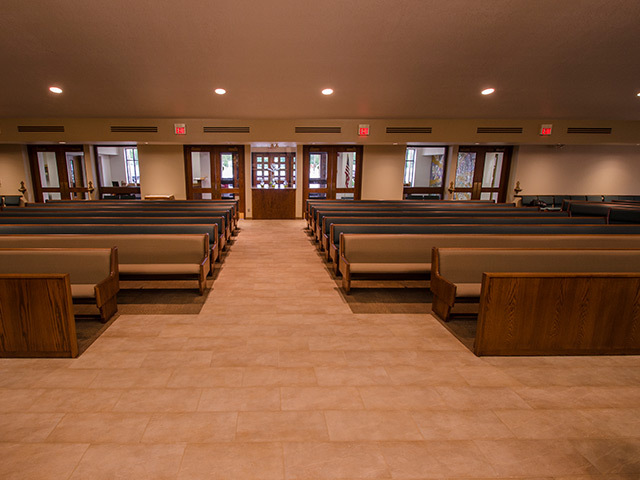 The chairs for ordained ministers, especially the presider’s chair, are also located in the sanctuary. The ordained priest, who acts in the person of Christ Himself, breaks open the Scriptures and allows the Holy Spirit to work through him to transform the elements of bread and wine into the Body and Blood of Christ. In addition to the presence of God in the Scriptures and His sacramental presence in the Eucharist, God is also present in the Congregation. The members of the Body of Christ gather around the sanctuary to grow in oneness with Christ and with one another. The Eucharist invites and challenges us to recognize His presence in each person we encounter both within and outside the Church building. As Catholics, we also recognize the presence and community of saints who have gone before us in faith and remain one with us. Prominence is given to Mary, Mother of God and First Disciple of Jesus, who models for us complete and total surrender to God. 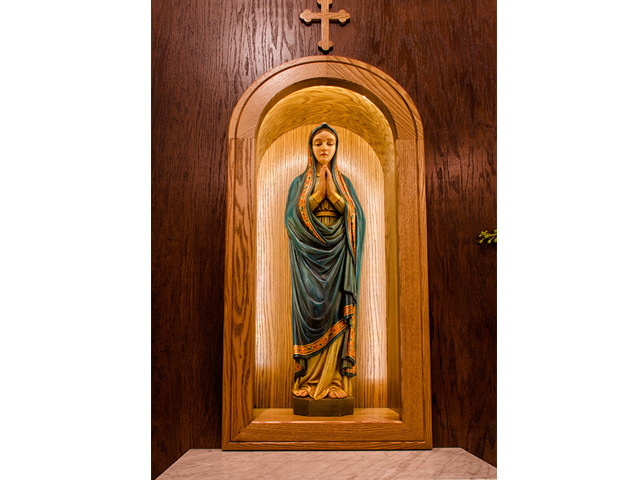 She remains our powerful intercessor and desires to draw us ever closer to her Son, Jesus. Ever in need of witnesses and role models, we look to St. Joseph, foster father of Jesus, for help in living our daily lives in the spirit faithful love. We are confident in his fatherly intercession and care in the matters that fill our daily lives, and trust in his care to bring us one day to enjoy eternal happiness. Each of us is invited to embrace a life of holiness and to become saints as we grow in our discipleship and following of Jesus. Most of us will not accomplish great things, but each of us can follow the path marked out for us by Christ in our own unique way. 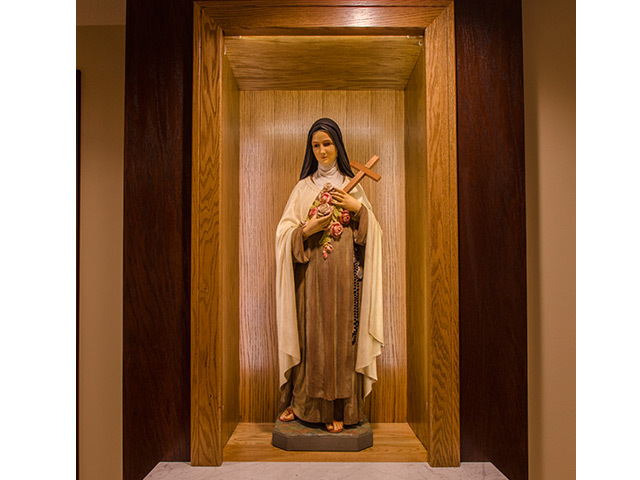 St. Thérèse, the Little Flower of Jesus, serves as the patroness of our parish community and church. Her simplicity and humble trust are a source of encouragement to us who live “ordinary” lives. In the spirit of her “little way,” we are all able to “do little things with great love” as long as we rely on the help of our good and loving God. St. Thérèse’s promise to spend her heaven doing good on earth stands as an open invitation for us to seek her intercession. 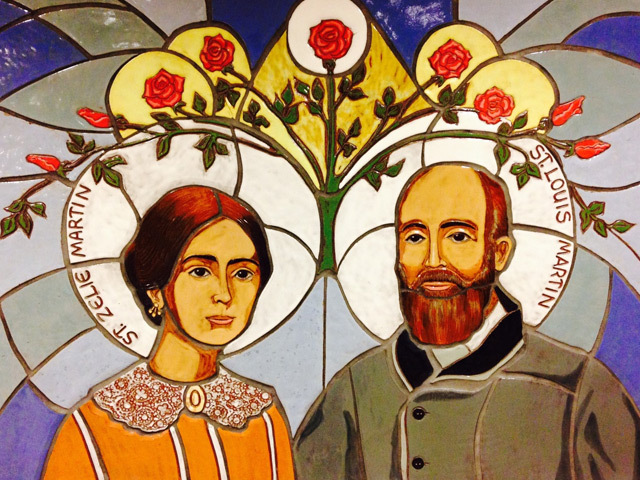 Saints Louis and Zélie Martin (Parents of Saint Thérèse) were canonized on October 18, 2015. The first married couple ever to be canonized in the same ceremony, they are held up for us as examples of a life of married love and fidelity leading to holiness. They were parents of nine children, four of whom died very young, and five daughters who all joined religious congregations. Our faith journey is marked by the ups and downs of human weakness and frailty. Jesus knew that we would fall, and in instituting the Sacrament of Reconciliation (confession), provided us with the means to begin again and embrace God’s life anew. 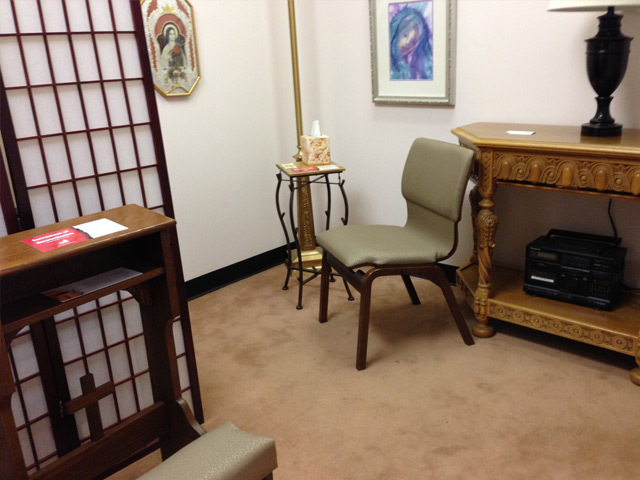 The Reconciliation Room is located in the Saint John Paul II Room, adjacent to the narthex. 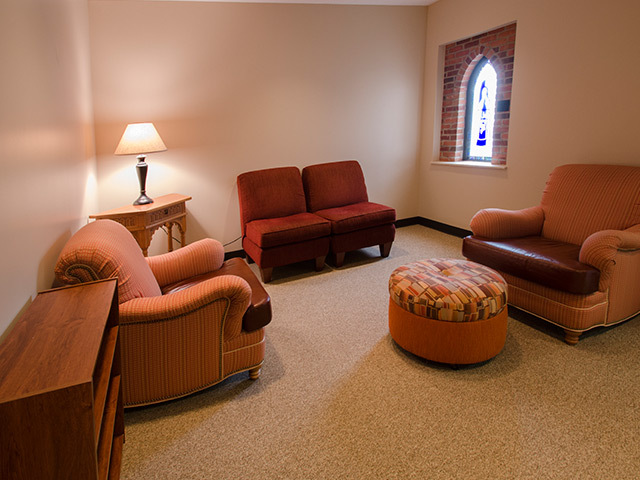 The St. Clare Room, located off of the narthex of the Church, offers a comfortable setting for anyone needing to step out of the Church for a time to provide child care or other privacy needs. 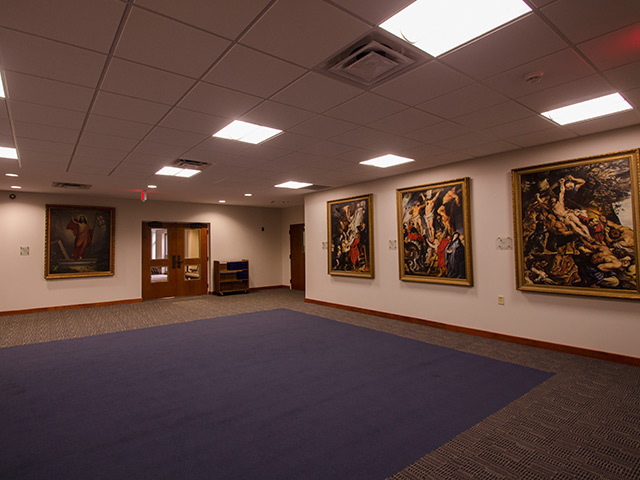 The space is also available before or after Mass for small group conversations and connections. 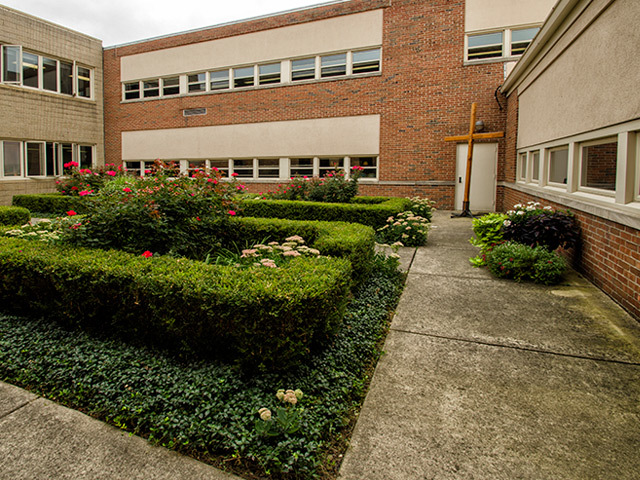 Little Flower Parish is blessed with lovely grounds and green space such as the rose garden situated between the Church and school. These beautiful natural surroundings raise our minds and hearts to our Good God, giver of all gifts and beauty. At all times and in all seasons, we remain committed to growing in our faith and to sharing this faith with all. 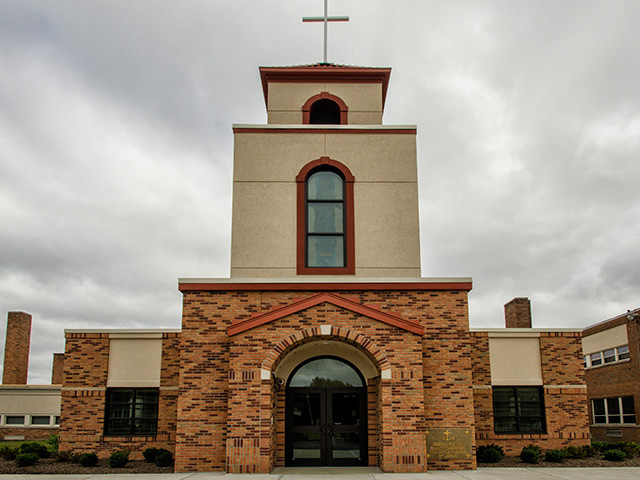 Our tower entrance displays stained glass windows (from the former St. Stanislaus Church) of the Immaculate Conception, Jesus and the Children and Saint Hedwig and serves as a vivid reminder to us of our place in the long line of Christians who have made the presence of Christ visible in our world. We carry this legacy forth in all we say and do. We invite you to share the journey with us!